There’s a fine line between including foods deemed healthy in your diet and eating nothing but! Teaching your clients the value of all foods can help them forge a healthy relationship with eating and may prevent them from taking their diet to a potentially dangerous extreme. What could be wrong with a desire to eat healthy? After all, promoting healthy eating is part of a dietitian’s job description. But when the urge to eat healthy foods becomes more of an obsession, there may be an eating disorder in the works—and the consequences can be dangerous. Although it is not yet a clinically recognized term or disorder, orthorexia is gaining wider recognition as cases continue to emerge and capture media attention. Steven Bratman, MD, author of Health Food Junkies — Orthorexia Nervosa: Overcoming the Obsession With Healthful Eating, coined the term to denote an eating disorder characterized by an obsession with eating foods deemed healthy. Like other eating disorders, orthorexia starts to negatively impact many areas of an individual’s life and, in some cases, can even lead to severe malnutrition or death, as the person increasingly eliminates food types from his or her diet. Perhaps one of the most alarming trends associated with orthorexia is that children are picking up some of these tendencies. Kids who watch their parents obsess over certain foods may mimic that behavior. And well-intentioned parents who strictly limit their children’s sugar intake or try to feed them only organic foods may instill a sense of fear in their children that other foods are “bad” or that scary things could happen if they eat them. Instead, parents should teach their children about moderation. Frequently eating trans fatty foods such as French fries or processed snacks is not healthy behavior, but neither is becoming obsessive about avoiding them or being scared to be around such foods. Because orthorexia is not an officially recognized disorder and is somewhat controversial, many dietitians may be unfamiliar with it. Some physicians and other health professionals say orthorexia does not require its own classification because they believe it is a form of anorexia or obsessive-compulsive disorder. Still, regardless of what orthorexia is called or how it is classified, dietitians should be aware of potential warning signs that could indicate something is wrong with the way a client views and eats food. The “worry factor” is one of the biggest indicators, suggests Tribole. “If a client has too much anxiety over what they eat, then that stress may be worse for their health than what they’re actually eating and can lead to these orthorexic tendencies,” she says. If you have a client who follows a particularly restrictive diet, try to gain a sense of their feelings about food and whether they’re behaving obsessively. “In other words, if they go to a party and they’re only serving fried foods, are they going to be devastated? Are they not going to eat all night? These are signs that their behavior is extreme,” warns Tribole. Like other eating disorders, orthorexia may also have a lot to do with control. Those with orthorexia often want to be able to heavily regulate the health food they consume. Kronberg says this may be particularly true of clients who have an unmanageable illness and have become desperate to take control of their situation. But a person’s desire to gain control doesn’t have to be the result of an illness. Orthorexia may stem from someone hearing about a negative effect of a food type or group and ultimately eliminating it from his or her diet. Fat is a good example, says Stokes. “Some people may have this intense fear that fat is bad and will kill them, so they avoid it at all costs,” he says. “But in fact, fat can be healthy, particularly unsaturated fats, [which] may actually be able to protect our heart and lower our cholesterol. We don’t need much fat, but we do need some. It’s important for the health of our skin and our hair. And we also have fat deposits throughout sensitive places in the body, such as on the temples to protect the skull from impact or around the kidneys to provide some cushioning” should someone fall. Some with orthorexia are focused more on what they do eat than on what they don’t. This could mean, for instance, eating only organic foods. But in many cases, orthorexic tendencies may drive a person to eliminate those foods that he or she believes to be bad—commonly carbohydrates, trans fats, animal products, dyes, and sugars. Doing so can ultimately lead to malnutrition. A recent article on orthorexia that appeared in The New York Times reported on an 18-year-old girl who began her struggle with food when she started eliminating all carbohydrates, meats, refined sugars, and processed foods from her diet. By the time she had gotten rid of all of the foods that she thought were not “pure,” she had brought her daily calorie intake down to only 500. Her weight fell to 68 lbs, and she was repeatedly hospitalized until she finally received help and restored her weight. Dietitians who specialize in eating disorders are most likely the best match for someone dealing with orthorexia. However, all dietitians can learn to recognize early signs and perhaps even prevent orthorexic tendencies from developing. 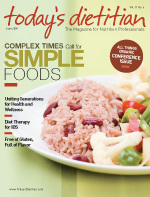 “In general, dietitians need to take the leading role in helping patients to ‘legalize’ all foods by educating about the nutritional value of all foods, as well as teaching mindful eating techniques and empowering individuals to use primarily internal cues when making eating decisions,” says Kauffmann.